The leadership at RS takes our tagline, “creating profound connections” seriously. With close to 1200 families we are compelled to think about how we are living up to this vision whether it be in our relationships with one another, the opportunities we create, the community we strive to build and/or how we support one another throughout our lives. Below Marge Piercy shares her insights about how complex and intricate a process it is. In our attempt to harness the power of technology in the 21st century to help us (along with all our other tools) achieve our vision, please look for 4 emails asking for your help in teaching us how we can be more effective in creating profound connections for every member of our community. Gnaw in the dark, and use the sun to make sugar. Live a life you can endure: make life that is loving. wilderness to the outside but to us it is interconnected with rabbit runs and burrows and lairs. This is how we are going to live for a long time: not always. For every gardener knows that after the digging, after the planting, after the long season of tending and growth, the harvest comes. Delivered this Shabbat in anticipation of former Congressman Patrick Kennedy’s upcoming talk at RS about mental health/addiction parity and de-stigmatization. At some point during my adolescent years, my father came home with a package and presented it to my sister and me. It was a box of 1000 red pencils, each adorned with the words, “Just say no.” With the image of a skull and crossbones right beside the slogan, on each one. Never known for his subtlety, my father’s loving gift reflected the oversimplified messages he was hearing in the 1980’s, about how to keep your children safe. By the time my red pencils ran out, scientists, educators, therapists and advocates began to discover more about struggles involving substance abuse and beyond. What does it mean to understand the role of the genetic component to addiction? Co-occurring disorders? Or that the stigma of addiction and of mental illness which can strip away respect, dignity and compassion? Consider the complexities of genetics, co-occurring disorders and stigma, on top of the challenges of peer pressure and temptations to escape, and the presumably well-meaning Just Say No slogan can become an obstacle. The “just” makes abstinence sound simple. Originally a response to a question a young child asked of Nancy Reagan, Just Say No, makes avoidance sound easy. If you fail to Just Say No, because perhaps you have a disease that appears to the rest of us as a choice, we blame you you for having a character deficiency. We assume your disorder is a result of your own wrongdoing, you are choosing a harmful path, you aren’t trying hard enough, we don’t want those choices to touch us, so we isolate you. You know we are going to isolate you, so you hide your vulnerabilities and those of your family. Perhaps so much so that you delay getting care. (Assuming you can afford care.) And the cycle of stigma continues. 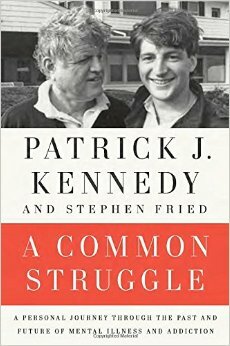 In former congressperson Patrick Kennedy’s Memoir, A Common Struggle: A Personal Journey through the Past and Future of Mental Illness and Addiction, he describes a scene that took place just after he revealed his struggles to the New York Times. There he was at a family occasion, surrounded bu relatives who were not happy about his public truth-telling. Yet, there were some exceptions. His cousin, Maria (Shriver) showed compassion to Patrick and said she thought was he was doing was fantastic. Maria showed support, she chose to bear witness rather than look the other way, and she offered her presence. I have come to believe that this is what the Misheberach, our blessing for healing, is about. More than it is a plea to God for healing power, perhaps the Misheberach is a plea to each other for the healing power we can provide others when we show support, choose to bear witness, and offer presence. A member of our Rodeph Shalom family, Becca Strober writes this personal blog post in response to the horrifying recent violence in Israel. She made aliyah some years ago and continues to teach us through her writing and activism in Israel. Our heart is in the East. You are currently browsing the BlogRS blog archives for March, 2016.